This next bracelet I got was from Target during a road trip with my girl friends earlier this year. It is supposed to be a lucky bracelet. If you haven't noticed, I am really big on mint and Tiffany blue. 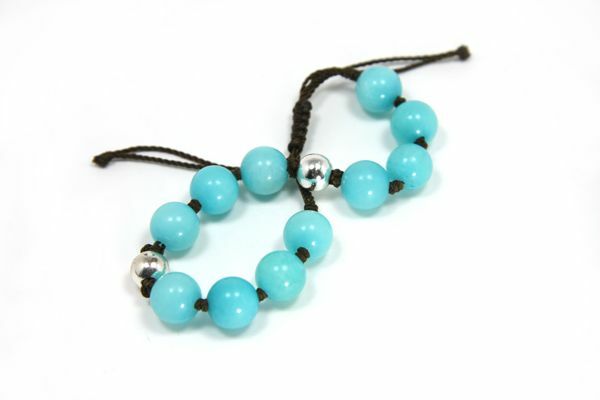 So how can I resist this gorgeous Tiffany blue bead bracelet? Target really has great selection of jewelery! I shall spend more time there when I go to the U.S. next time! So here's my casual and slightly hobo WOTD. I feel like I'm in school again because these are really what I would wear when I was in high-school/university. I think these go very well with T-shirt and jeans/shorts/denim skirts! Plus it's crazy hot outside, these are less heavy and less sweaty =). Anyway, what are you wearing on your wrist this hot Friday? Do you go casual with your jewelery too on Friday?